We review Photosynthesis, a new arboreal game published by Blue Orange Games. 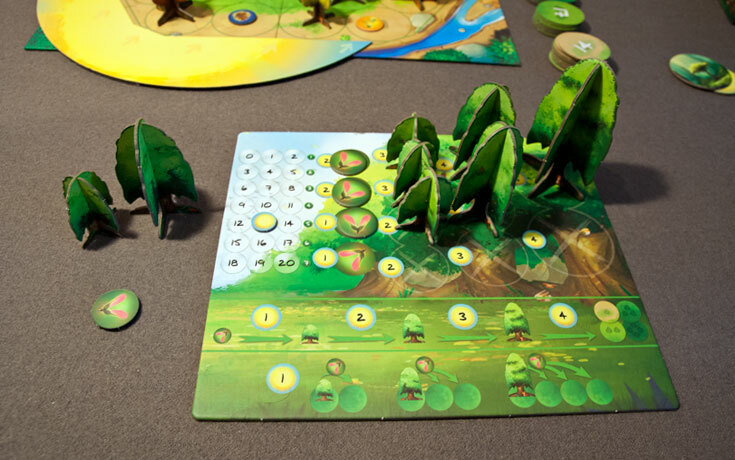 In Photosynthesis, players are trying to earn the most points by completing the life cycles of their trees. Can you judge a game by its cover? Probably not, or else many of those eurogames would be tragically bad (Caylus, I’m looking at you!). That being said, a great cover can get you to stop and take notice. That’s exactly what happened to me when I came across the cover for Photosynthesis, a new arboreal game from Blue Orange Games. It was beautiful and compelling all in one shot, and I had to know more. 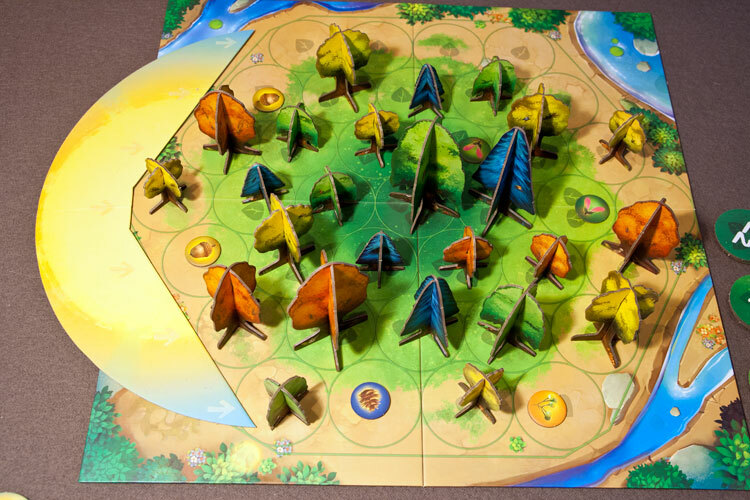 Photosynthesis is an abstract strategy game for 2-4 players that takes about 60 minutes to play. 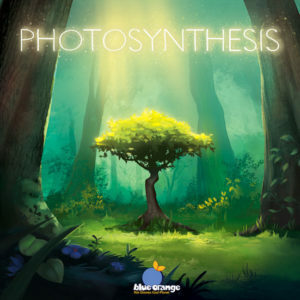 Photosynthesis plays well at all player counts. 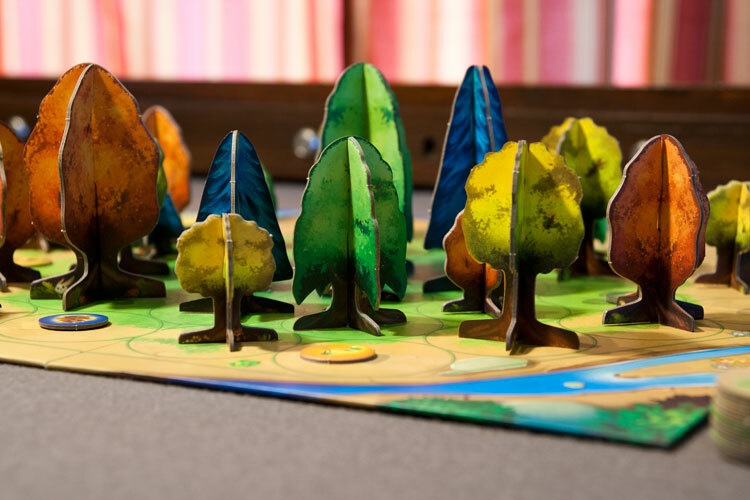 The player boards not only house your trees, but explain all the costs. 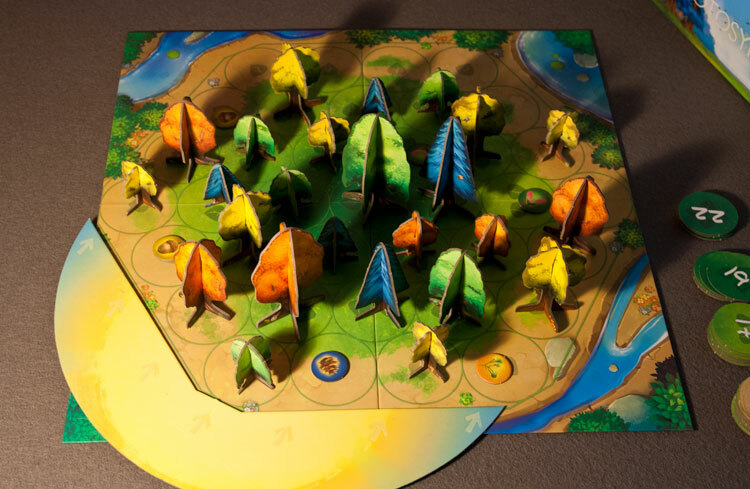 The sun is moved to the next segment on the board clockwise and players total up their light points from the trees they have on the board. The light “shines” from where the sun marker is at, and tress will earn light points based on their size. Trees will also cast shadows based on their height, and will block other trees in their shadow from earning light points. In player order, each player can spend their light points to buy, plant, grow and collect trees. Each seed and tree has a cost in light points to add it to your ready area. Once in your available area, light points can then be used to move a seed to the board. Players can also grow a seed into a small tree, a small tree into a medium one, and a medium to a large. Finally, a player can spend 4 light points to harvest a large tree, earning victory points based on where it was on the game board. The closer a player is to the center, the more points. The only other thing to be aware of is that players can only interact with a space on the board once per round. So you can’t grow the same tree twice, or plant and grow it in the same turn. Once the sun makes three full revolutions around the game board, the game ends and the player with the most points wins. Trees can cast shadows on other trees, depriving them of light points. First of all, in case you can’t tell from the photos, Photosynthesis looks amazing. The artwork is beautiful and when the trees are laid out across the board in varying heights, it looks like a real forest. As it’s essentially an abstract strategy game, the publisher could have gone a lot of routes with the components. They could have even used wooden blocks and the game would work just as well. But they didn’t, and the fantastic package they put together defiantly makes the game more enjoyable to play. However components would mean nothing if the game play didn’t hold up, and thankfully it does. The mechanics are very easy to learn as the player boards do a great job of handholding the players through their turn. Everything has a labeled cost, and it even shows upgrade costs and other relevant information. That makes Photosynthesis an easy choice to pull out with your non-gamer friends as questions should be minimal. The artwork and components in Photosynthesis are very well done. When it comes to player scaling, I’ve found that Photosynthesis plays somewhat different at each of its player counts. A 2 player game is going to have a lot of spaces for expansion, so it can turn into a very strategic affair. Chances are the spots you want for your trees will be open. Simply form a plan and execute. However at the four player count, competition is going to be fierce for prime real estate and the game can actually get a little mean (if that’s your group’s style). Because trees can block other trees from earning light points, there will be plenty of times when you can block an entire row of your opponent’s trees with a well-placed tall tree. The game also migrates from strategic to tactical here because the board state can change a bunch in between your turns, so you will definitely need to be flexible and ready to react. In a four player game, the competition for spaces can get very cutthroat. And as accessible as Photosynthesis is, it can also be a very thinky game. You have to place your tress carefully to make sure no one is blocking their light. Then, you have to decide when you harvest your trees. Those level 3 trees earn you a lot of light points, but they don’t do you any good until you cut them down (earning you the bulk of your victory points). So there is a risk vs reward nature to the game where you have to try and determine the best opportunity to cut your trees down against future earnings. Plus, the victory points decrease as players collect tokens, so that’s another factor to consider. As much as I’m enjoying Photosynthesis, and I definitely am, I have found that the end game can be sometimes lack luster. The first round is going to be a quick ramp up, with the second round containing the most actions and longest turns. However the final round will be all about trying to maximize your points. Yet since you can only interact with a space on the board once per turn, the last couple of rounds can be a bit slow (or even boring) if you didn’t play exceedingly well. 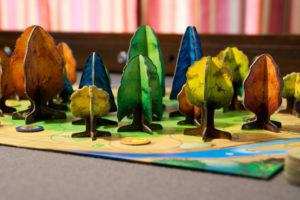 In one game, players didn’t even take any actions in the final round, because you can’t grow and harvest a tree in the same turn. So usually it was just better to do nothing and collect some light points (which earn VPs). Big trees can block the light for smaller trees behind it. I was really hoping that I’d like Photosynthesis and I’m glad I did. The components looked so good and the theme was a fresh one. The game ended up being easy to learn, yet still provided more than enough depth to keep just about anyone entertained. And for an abstract strategy game, it actually uses its theme quite well. The sunlight mechanic in Photosynthesis is very clever and growing trees made perfect sense. 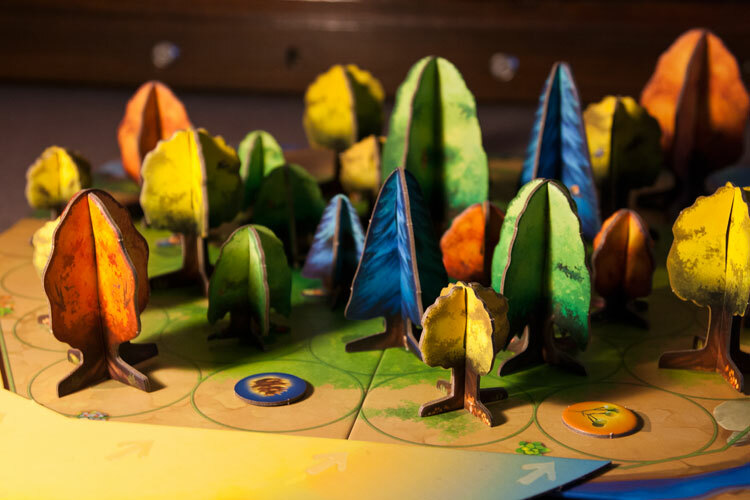 Whether you are looking for a new gateway game, a game to play with your family, or even a light game to play with your gaming group, Photosynthesis can easily slide into any of those roles. This one will be staying in my collection and I can easily see it making its way to my gaming table quite often. Final Score: 4 Stars – A unique, accessible, and excellent looking game that plays well at all player counts.